As a business owner, no matter what the business, security is probably at the top of your list of priorities. You hire a security guard, you install a security system, and you institute an ID card system to ensure only authorized personnel enter your facility. What else is there? Security: First and foremost, chain link fencing, vinyl coated and uncoated, is a great addition to any business, instantly boosting your security. Durability: Chain link is already incredibly durable. Add vinyl and you have yourself a commercial fence with an impressive shelf life. Scratch Resistant: Chain link fences are some of the most durable on the market. Vinyl coated chain link fences are no different. Maintenance: When it comes to vinyl coated chain link, maintenance is a breeze. There is no need to repaint or stain, and repairs are easy. Aesthetics: Unlike ordinary chain link, vinyl coated chain link is visually appealing, giving you not only the security you desire, but also the curb appeal you love. Affordable: Best of all, vinyl coated chain link will not break the bank. This commercial fencing is extremely affordable, which is so important when trying to turn a profit. If you are interested in learning more about your commercial fencing options, you have come to the right place. 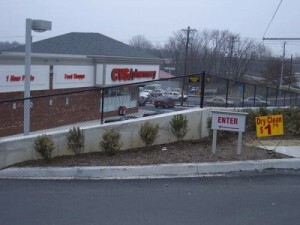 Since 1955, Hercules Fence of Manassass, Virginia has been providing professional service and quality installation for both commercial and residential fences. When you call today, a trained commercial salesperson will listen to your wants and needs and explain what product is right for you and your business. Hercules Fence has proven to be a trusted source to use the right material and offer you the right specifications for your needs. Please contact Hercules Fence of Manassas, Virginia today by calling (703)551-2609 or visiting our website. Also, check out Hercules Fence of Manassas on Facebook,Twitter, Google+ and YouTube! This entry was posted on Thursday, November 14th, 2013 at 2:55 pm. Both comments and pings are currently closed.